show me the past 200 years and i’ll tell you if i’m worried or not as the case most likely will be. you knwo what they say. Lies, damn lies and statistics. There are two types of weather in Belfast. If you can’t see the Cave Hill, it’s raining. If you can see it, it’s gonna rain! John, we have a half of a micro-nano second of information on the climate of this planet. There is no way we can or will know if what we are doing (and we’re not) is affecting the planet given the NUMEROUS times the climate has warmed and cooled… all without us even being on the planet. Step away from the Kool-Aid John. It’s not good for you. Oh and anther thing too… The best way to convince people of something to be true is to continually perpetuate the premise. In other words, regardless of the truth, continue to tell people that the problem is “X” and the solution is “Y” and voila, mind control. It is called Neurolinguistic Programming. Much like a salesman that makes the same sales pitch regardless of the veracity of the claim. They speak in shades of truth, just not complete truth. I get this all of the time with regard to engine emissions… but that’s for another time. I watched an infomercial on a water filter system. It’s claim was the it was better than Reverse Osmosis because the RO system made the water more acidic. In reality that’s only partially true. It does reduce the Ph of the water, thus making it more acidic. The whole truth is that it takes the water from an alkali state to a Ph neutral state. That occurs by bringing down the ph level of the water, effectively making the water more acidic; but really less alkali. It’s a play on words and technically correct, but not wholly. The idea is that you don’t want to drink acidic water because it removes vital nutrients with it. That’s wrong too. Apply this to the idea of man-made global warming or climate change and you will understand my points. They (the AGW consensus “scientists”) perpetuate a perceived correlation to CO2 and temperatures. They can’t possibly be wrong, right? So regardless of whether they are correct, the claim that they are and you have what we have today… a global warming “consensus.” Don’t buy it. There is not enough information to make an educated guess about this issue. It is only fear mongering. Both right and left are good at that, don’t you think? Actually my comment on the above graph is meant sarcastically (ie. 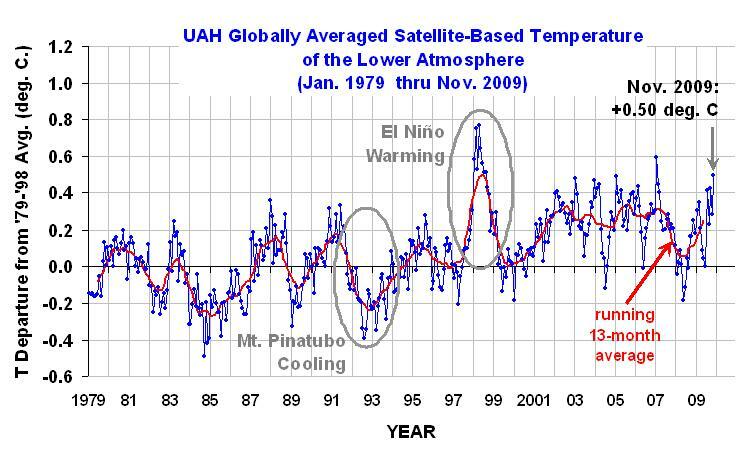 the earth has warmed a whole half a degree since 1979… frightened yet?)…. We agree there isn’t enough information yet to act…. That doesn’t mean it’s a hoax my friend. Actually John, it could mean that it’s a hoax. My position is this… In the graphs that you showed and some that I have seen, show that CO2 levels are related to warming temperatures. However, I believe that there is no way to tell whether mankind’s activities are having any effect. That during the natural cycles, CO2 levels rise with temperatures, but that the levels vary. In terms that are easily discerned… if a year is represented by 1/1ooo of an inch, it would stretch out just over 71 miles. With the information we have for the past 150 years, is represented by .15 inches. There is no way possible to accurately assign a cause to the effect of allegedly rising temperatures. It is entirely possible that those “consensus” scientists are creating this correlation for a much more insidious reason. Thus making it a hoax. The just over 71 miles is 4.5 BILLION years… sorry. I got ahead of myself. Well John, it may be nutcase stuff and you’re right I am no nut. It appears that the US among other countries, are going to enter into an agreement by which millions of dollars are going to be funneled to less developed countries to help them get to 2nd world level status. And really I am not saying that they are faking as much as they are just not knowledgeable enough about the history of the climate on this planet to make an even remotely educated and reasoned hypothesis about climate change. That’s really it in a nutshell. I do think that there are political ramifications for which no one is ready. In the Information is Beautiful article to which you refer, if you read what is written and really pick through it, you’ll find that there are a great many suppositions about cause and effect that are at best guesses. The “3 to 9 degree increase will cause devastation” is just not true. The ice cores that show the planets temps were 9 degrees warmer 120,000 years ago with no devastation is “proof” of my point. They have no idea how resilient the planet is, and are creating a crisis to stop the excesses they feel are causing an issue that they can’t fully prove is even happening. If you want to argue that CO2 is causing the increase in temps, and a chart is shown that indicates CO2 levels rise with temperatures naturally; without us being on the planet, how does anyone know to what degree human activity “raises” the naturally occurring CO2 increase? My position is that it’s entirely possible if not probable that our impact is as minimal as 1 or 2% increase in CO2 levels. That’s not enough to raise temperatures to such an extent as to cause devastation. In the section that says “CO2 makes temperature rise worse. Much worse in fact.” Where do they get their numbers? Are they based on the same flawed “science” Al Gore used to create a model that allows for devastation of the planet for 1 degree increase in temps? Especially since I already know that the planet was 9 degrees warmer and we’re still here! The temperature record section that states that distortion of temperature records is a very real phenomenon but that filters are applied to weed out the bad data. How do they know that? How is it possible that they have it perfectly correct? I am not so unbelievably arrogant as to state unequivocally that my position is 100% correct. Are you? Are they? Is there no way that half of the scientists who are advocating the idea of AGW are off in their calculations by even 50%? The answer to all of this is that we are no where near ready to absolutely state that a)temperatures are rising because of human activity and b)human activity can be altered to counteract what the climate is going to do. In other words, we are at the earth’s mercy. In nature it is called survival of the fittest. Either we adapt to what is happening, or we spend our time worrying about something over which we have no control and are not in any way ready for the evolution of the planet. My analogy about the timeline of the earth and our records of the weather is fairly accurate. It is akin to waking up at midnight, when the “day” begins and try to predict what the weather will do for that day based on only what you see. No trends, no seasonal norms etc. Is there any way someone with that limited knowledge could make an accurate forecast for any day? Australia’s input towards Global Warming!